Munsell’s soil color system was employed by scientists studying 200 acres of forest in Montpelier, Vermont. Technicians spent several days obtaining soil samples for laboratory analysis, extracting soil from different locations, and at different depths. Soil in this area derives from greenstone, a rock material metamorphosed from Pre-Cambrian lava flows. Greenstone is highly conducive to plant growth. Over time, an undisturbed layer of greenstone will often become covered with reddish brown (Munsell color 2.5YR4/4) topsoil, strong red (Munsell color 2.5YR 3/6 or 4/6) and silt clay loam. 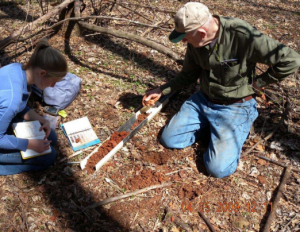 Among other factors, scientists evaluated and classified the color of soil in the forest’s topsoil and loam layers to help discover soil accumulation and erosion rates, in order to examine human impact to the area. They determined that the greatest impact to the land occurred in the eighteenth and nineteenth centuries, mainly from more primitive farming methods that plowed the earth more deeply than modern surface farming. Munsell’s color matching system for soil allows scientists to accurately record very specific soil colors, and later reproduce those colors using soil color charts as soil indicators for lab testing. What we commonly refer to as color is actually a combination of three visual measurements – chroma (saturation), value (light reflection), and hue (wavelength dominant). Soil color is an excellent indicator of soil structure and components, as well as characteristics of wetness and drainage. The color of soil can also reveal a lot about geological history, weather changes, and environmental factors, even before soil sample analysis. Red, yellow, or brown tints to soil indicate the presence of iron oxide. Soils that appear white have more carbonates, such as salts. Progressions of decomposing organic matter make soil dark brown or even black, a purple or purplish black soil color has probably been affected by manganese oxides. Earth soil is comprised of numerous different elements, including water, organic matter, minerals, and even air; on their own each of these produces variants in soil color, and the numerous possibilities for each of these basic components produces literally tens of thousands of color differences. Because people’s color vision also differs, a mathematical color notation system is essential. The Munsell color system is an international standard for environmental scientists to codify color communication. The study, “Soils and Land Use in Montpelier’s Landmark Forest,” was authored by W. Cullen Sherwood, of the Department of Geology at James Madison University.